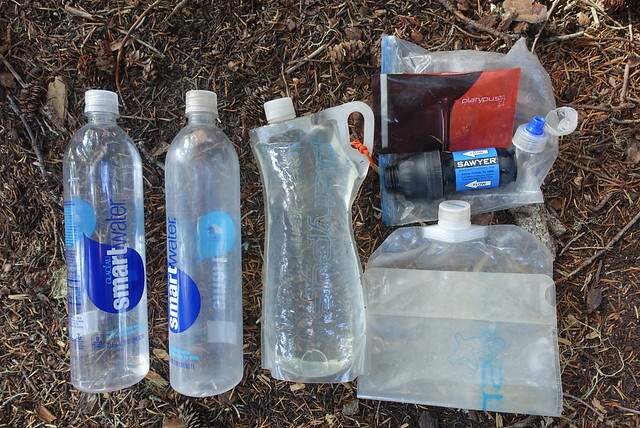 Water on the PCT is one of the things you think about all the time--how much water should I carry right now? Is there going to be water at the next water source? Will the next possible campsite have water, or will I have to carry a few liters to get me through until the next morning? What about relying on water caches? What should my maximum water carry capacity be? The first question took a few weeks to figure out. I started out with carrying one liter of water for every five miles... and I ran out the very first day, around mile 18, as I made my way to Lake Morena campground for the night. That really spooked me a bit--not that walking two miles without water is all that far--so I often carried more than I needed. Eventually I ended up with "one liter plus a bit more" for five miles, and "two liters plus a bit more for ten miles." And for those cool mornings, I wouldn't need to take as much either. The question as to whether there would be water or not was a good one. The PCT Water Report is updated really frequently, but I started in mid-March, and most of the reports were months old, and even then they were a bit vague--if the person reported "light flow" did that mean it would take ten minutes to fill a liter, or 30 seconds? Combined with the drought this year along the entire PCT route, I often (again!) ended up carrying more water than I should... and when I got to a decent enough water source, I'd fill up the "dirty water" bag for later filtering. Campsites are one other consideration for water. Of course, a campsite with water is great, but often a nice level spot for a tent has no water at all. More often than not I needed to filter water beforehand and walk with that heavy water to the campsite, which hopefully wasn't too far of a walk, maybe a mile or so if I was lucky. In general, I'd filter three to four liters of water a night, so I'd have enough for cooking in the evening and morning, as well as some for the trail in the morning. You'll always want to filter water at night; it's often just too chilly in the morning and you'll get cold and wet, plus snow-fed streams flow better in the evenings as well. An aside: campsite choice, as it were, is also one of they key differences between PCT long-distance hiking and a more typical backpacking trip. On the PCT, you know how far or what time you'll want to stop and look for a campsite, you'll decide probably the day before or the same day what 'campsite' to use, and you won't be too concerned about its location or amenities. When you're backpacking, you'll probably have preplanned every night's campsite. 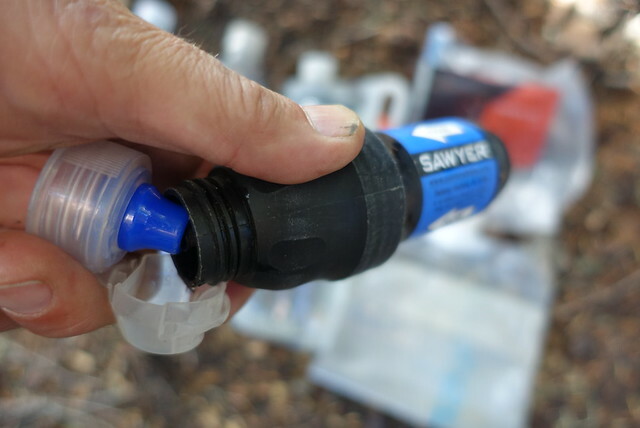 Water caches are a controversial issue on the PCT. I just decided that I'd carry enough to not need to use them, but if I could use some water from them I didn't hesitate to take a liter, like at Third Gate Cache and Kelso Valley Road. On Hat Creek Rim I actually did take quite a bit more than a liter--I drank almost a full gallon; we rested for three hours in the midday shade at Cache 22, waiting for the 100 degree heat to subside and/or a breeze to kick in. That last question of how much water capacity do I need was also answered after the early days of hiking through the desert. There are a few places where there's ten miles between water sources, a handful of 16 to 20 mile possibly waterless segments, and one place where there was no water for 35 miles. For that last one, which was California section F north of Tehachapi and highway 58, I carried 7 liters of water, and ate no-cook meals for those two days. OK, back to the water gear (and the picture of it again). This was taken in late July in northern Washington, near the end of my PCT hike, so it's what I ended up settling on. From left to right, here's what I took. Bottles: Two Smartwater bottles. These are the handiest and most durable canteens out there; plus they come with an extra liter of water as a bonus :-) I use two bottles and they go in the side pockets of my pack for easy access, they're a grab away. One bottle usually is flavored with Crystal Light drink mix (I really like the peach-mango green tea flavor), the other is plain water. If I needed more capacity, I'd just buy another couple of bottles. Dirty water bag: Platypus one liter Platybottle. The little orange cord reminds me that this is unfiltered water. I then use this to squeeze water through the Sawyer filter, instead of the squeeze bag that came with the Sawyer. I used the same bag for the whole trip, and it didn't leak at all. Water scoop: The bottom of a Platypus Platypreserve wine bag. I use this to fill the dirty water bag from a lake or shallow pool. It takes about ten full scoops to fill the bag, sometimes more. For awhile I carried a 600ml Gatorade bottle to do the scooping, but that didn't work for shallow puddle-like pools, and just felt like extra baggage. Water filter: Sawyer Squeeze. This is just the regular size. It works well. I keep it in a ziplock bag because it'll still have a bit of water inside after you filter, and if it's going to get below freezing I can put the ziplock bag in the foot of my sleeping bag. Extra water bag: Platypus 2 liter water bag. I'd fill this up if I had to carry extra water to a dry camp, use the water for cooking and washing, and then put any extra in a bottle for the morning hike. One more note on water: when I started I used a hydration water bag and tube and bite valve. I liked it a lot. The problem with any hydration system is that it's hard to know how much you have left, and when you stop and need to get more water you have to disassmble your pack, haul the bag out, fill it up and make sure it's back in its place, then pack it up. I found myself using the hydration system as more a backup to the Smartwater bottles, then I just decided to get rid of it altogether. It was just a bit too much hassle for me.